D’mev blanched before speaking. “Commander, we are under cloak, per your orders. A Tholian fleet is massing within the Azure Nebula; it seems we encountered their vanguard during our investigation of the temporal anomalies there.” Nenid nodded as she called up tactical data to the main viewscreen. “Damage control operations have begun,” replied the chief engineer from her chair’s personal speaker. “I can’t speak for your dental situation, Commander, but the ship will be ready to fight in minutes, per Republic battle doctrine. Engineering, out.” Nenid chuckled to herself as she beckoned her young, Academy-fresh science officer. He was clearly shaken; this was his first actual experience with space combat. Nenid silently vowed to herself that it wouldn’t be his last. “Science officer,” she said confidently as she studied the battle data flowing into view upon the main viewscreen. “Begin passive scans of the Tholian fleet. I want to know their combat disposition, ship types, crew compliments – everything – and quickly.” As the young Reman at the nearby science station began to comply with a single “Yes, Commander” in response, Nenid turned to her communications officer. Another fledgling barely old enough to enlist, she thought. I ask for veterans and they send me children. So be it. Here begins the lesson. Join in as part of a strike force to defeat the Tholian Fleet in the Azure Nebula. 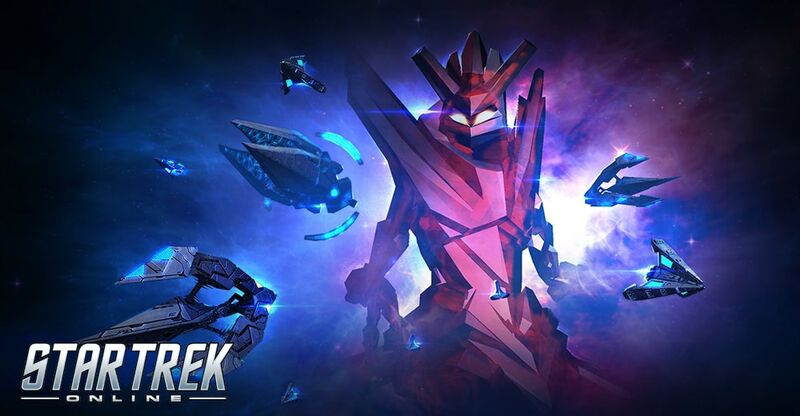 The Tholian Red Alert will be available for Console Captains level 50 and up from Thursday, March 21st at 8am PT to Monday, March 25th at 10am PT (Romulan players must have selected a faction). Players will be directed to an alert when a Tholian fleet appears in Sector space, or you can access the alert from the Task Force Operations page. The queue rewards 35 marks of your choice, with no cooldown! We can't wait for you to experience this gornucopia of new content when Gorn of Discovery arrives in Star Trek Online later this Gorntember. The Galaxy's Newest Sensation: Tribble Darts! The galaxy's newest sensation is coming to Quarks! Don't walk, run!